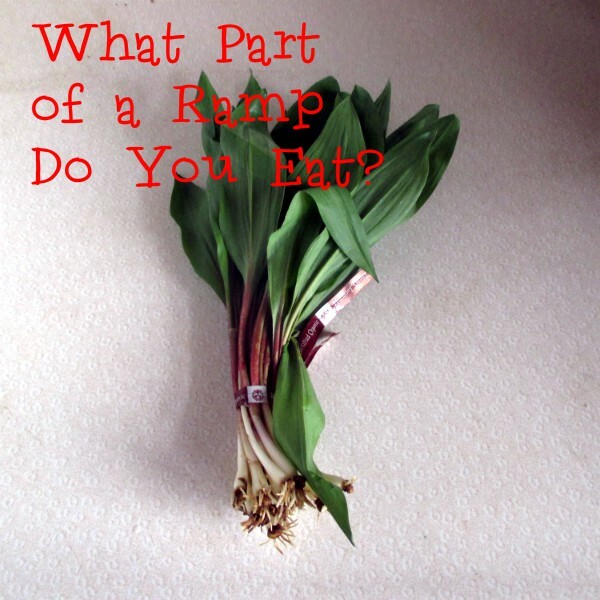 What Part of a Ramp Do You Eat? It’s the time of year again. The time of year where foragers are foaming at the mouth, searching the forest for spring’s early bounty. What are they looking for? The morel mushroom, the Fiddlehead fern, and the topic of today’s conversation – the ramp or wild leek. You may find it just as much of a search to find these items in your grocery store. Only more specialty stores like Whole Foods Market (I bought an organic bunch there for $2.99 a bunch) and local small produce shops will carry these products. If you can find ramps you are in for a treat. Not quite onion, not quite garlic, but flavors of each that come bundled in a unique package. That brings us to the question of what part of the ramp is edible? First, let’s take an anatomy lesson. 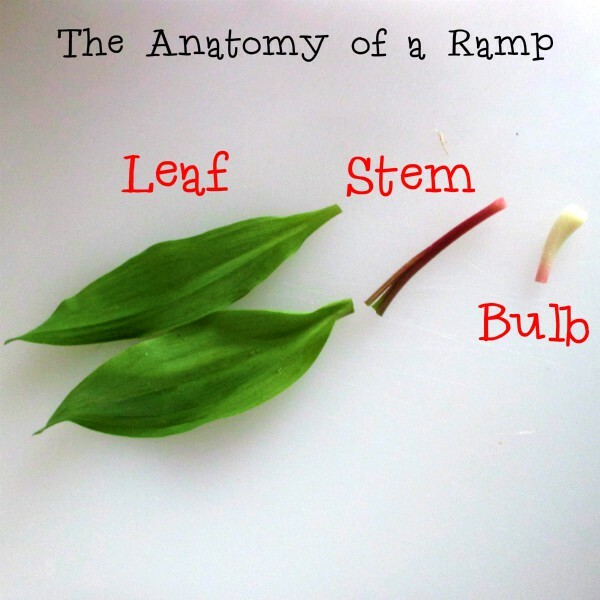 As you see in the lovely diagram above, I have divided the ramp into three parts – the leaf, the stem, and the bulb. All three of these parts can be used and I do my best to utilize them all. This is what most people are use to using. It kind of looks like a really, really small onion. The end of these things are full of little roots that trap dirt, so I cut off the roots as close to the end of the bulbs as possible. Then I dice them up like I would garlic. Saute them just as you would garlic. I tossed them in at the beginning of a Ramp/Asparagus risotto dish I made last night. If you are lucky you will get a nice bunch of bright green leaves with a red vein down the middle. These are completely edible. I like to use them like an herb. I rolled them up, like a carpet. Then slice them into ribbons or what fancy chefs call a chiffonade. Here is an excellent video I found on YouTube that shows you how to chiffondade like a pro. I add the leaves at the end of cooking. Like when I making the previously mentioned risotto, I threw them in at the last minute, just to heat them through. You could also just throw them in a pan with some butter and cook them until they wilt and eat them like you would spinach, chard, or kale. Or you can make pesto from the leaves (toss in the bulbs too). When you got ramps, you can really ramp up the possibilities! This is where the most waste happens. The stems between the leaves and the bulb can be a little tough, a little fibrous. You can cook ramps whole and eat them just fine. Here is my preference. Cut off the leaves and bulbs. I then take the stems and throw them in the freezer along with my other veggie scraps for the next time I want to make homemade vegetable broth. When I made that risotto I included roasted asparagus (if you aren’t in a risotto mode after this post, you must hate rice!) and save the ends I cut off the asparagus. I will make my Asparagus End soup with them soon, and include the ramp stems. Won’t that really ramp up the flavor! (I know I did the twice in one post, but ramps are only available for a short time, so I only have a few chances). Jump aboard the spring time veggie bandwagon and find yourself some ramps or wild leeks if you prefer. They are a wonderful way to start getting excited about another year full of fresh and tasty produce. Share with us your ramp experience in the comment section below. I would love to hear from you. By the way, if I have pressured you into making risotto, check out Alton Brown’s recipe. It’s what I used minus the mushrooms and plus the ramps. Thank you for your useful information on ramps. I had no idea what they were. I’m currently writing an article on Spring Soups for FoodQuestions.net and will link to this article for support. Hopefully, you send some support my way in return, but either way, thank you!